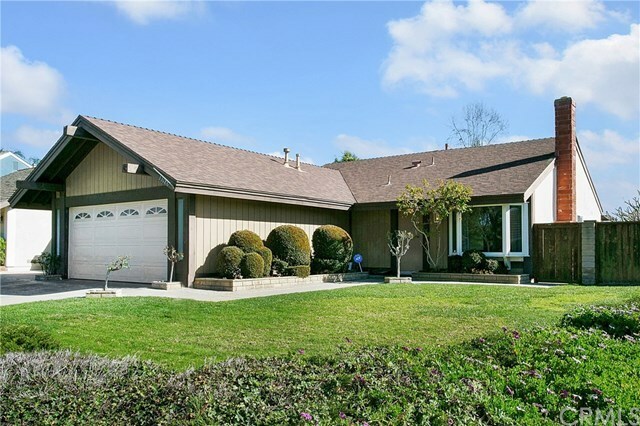 Charming single level home located on a corner lot across from Sea Canyon Park less than two miles from Dana Point Harbor and Doheny State Beach! Great value for this 3 bedroom, 1.75 bathroom home with large grassy front yard and large enclosed side and back yards. RV parking conveniently located on side of house to store your weekend toys. The living room and kitchen have vaulted ceilings and is separated by a three-quarter wall. Cozy fireplace and bay window with seat, as well as a large double-door closet with built-in shelving in the living room, and a cheerful light and bright kitchen with a garden window above the sink offering a view of the backyard. Sliding glass door off kitchen leads to the covered back patio and grassy lawn with mature fruit trees and other landscaping. Extra storage in the shed located in backyard as well. The master bedroom has its own private bathroom, a large walk-in closet and window facing the back yard. Linen closet just outside the master bedroom and a closet with built-in drawers for storage in the hallway. Second and third bedrooms are located down the hall across from the full bathroom. The two car garage has a roll-top door and a laundry area between the garage area and house. Directions: Golden Lantern to Acapulco Dr, left on Caracas St, right on Antilles Way, right on Trinidad Dr. Corner of Antilles Way and Trinidad Dr.